Dr. Aaron Tabor has created a new collection of anti-aging skincare products with clinically proven ingredients that nourish, protect and repair the skin from the inside and out. A graduate of the Johns Hopkins School of Medicine, Dr. Aaron Tabor has devoted his career to researching and developing scientific and medically based anti-aging solutions, including groundbreaking natural skincare therapies, and natural beauty and health products. Dr. Tabor's products help women achieve total health, wellness, and beauty from the inside out and feature only the most natural proven ingredients of the highest and safest quality. His products have been featured on QVC, Good Morning America, InStyle Magazine, Glamour and many others. Here are the products from his new skincare line he sent me for review. Formulated to simulate a younger look in seconds, Dr. Tabor's 60-Second Face Lift uses scientifically-studied nutrients to immediately tighten and firm skin, erasing the appearance of fine lines and wrinkles. Working instantly for noticeable results, the highly effective ingredients in this product also continue to work all day to improve the skin's appearance in the long-term. It's free of of parabens, sulfates, soaps, artificial colorants and fragrances and other toxins. 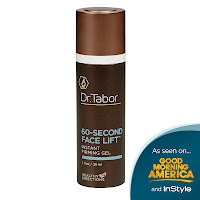 My Review: The 60 Second Face Lift Firming Gel really works! My skin looked and felt firmer and tighter in seconds. I really liked the texture of a gel to a cream. I didn't have any reactions such as breakouts, dryness, rashes, ect. I used it daily under my moisturizer and whenever I felt wanted to give my skin an instant firming appearance. I noticed fewer lines and wrinkles and more even skin tone with each application. Results are promised in just three days and they deliver after the first application. This intensive gel is made with some of the highest quality ingredients. So if your looking for instantly firmer, tighter skin, this a must try. You can learn more and order yours at Healthy Directions. Dramatic Rescue Anti-Aging Wrinkle Serum is a deep treatment serum that works to reduce the signs of aging. An intensive serum composed of clinically researched anti-aging peptides and collagen-supporting nutrients, it safely reduces wrinkles, dryness, and increases firmness with noticeable results in as little as three days and continues to improve your skin the longer you use it. It's free of parabens, PEGs, glycols, sulfates, petrochemicals, phthalates, artificial fragrances, synthetic colorants, 1,4 dioxane and soap-based emulsifiers. My Review: This nutrient packed anti-aging wrinkle serum really delivers. It's full of high quality, anti-aging ingredients that work together to create more hydrated, smooth, soft and younger looking skin. I noticed a difference from the very first application. My skin looked noticeably younger and felt smooth, soft and hydrated after just one use. Results are promised in just three days and they deliver the first day. It's rare to find such high quality ingredients full of the good stuff and none of the bad. This is a must have product and I highly recommend you try it. You can learn more and order yours at Healthy Directions. To learn more about Dr. Tabor's skincare products, visit www.HealthyDirections.com. You can also follow Dr. Tabor on Facebook and Twitter. These products are pretty expensive... I would love to try them, for free :) Would you actually buy them?